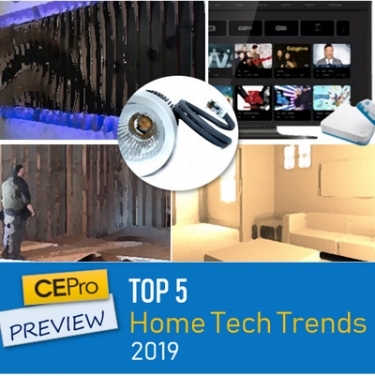 PREVIEW: CE Pro's Top 5 Home Technology Trends for 2019 address opportunities and challenges for smart-home pros in wellness, low-voltage lighting, cord-cutting, architectural design and the labor crisis. January 2019 Preview: Architectural design, extreme cord-cutting, workforce challenges, wellness, low-voltage lighting are CE Pro's Top 5 Home Technology Trends and Opportunities for 2019. CE Pro editors, with help from the smart-home integration community, have selected the Top 5 Home-Technology Trends & Opportunities for 2019. 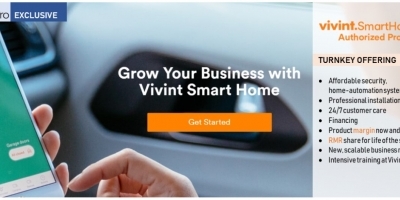 The annual list includes product categories such as home-automation, entertainment and networking, as well as macro trends like new-home construction and shifting demographics. As always, we highlight five themes that will begin to gain steam in the new year, and ultimately impact the smart-home channel in a substantial way. 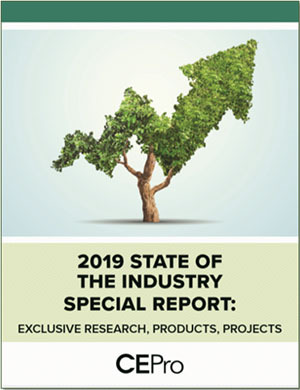 The full Top 5 feature will appear in the January 2019 State-of-the-Industry issue of CE Pro, and online at the end of December. Sponsorship opportunities are available. 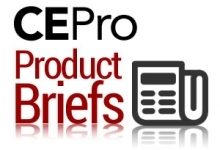 Contact your CE Pro sales rep. Here are the themes we selected for 2019, followed by a list of the Top 5 from previous years. We have covered sub-categories of “wellness” over the years, including home health technology and – just last year – tunable white lighting for simulating natural daylight to improve productivity, sleep, moods and overall health. This year, we cover the full gamut of wellness-enhancing technology and services, including lighting, indoor air quality, sleep aids, sounds, visuals, scents, activity monitors, remote patient monitoring and virtual reality. The wellness movement – with well-living labs, cruises, hotels, workplaces, and more – really took hold in 2018, and will accelerate quickly in 2019. ⇒ Dealers and other industry pros overwhelmingly selected Wellness for the 2019 Top 5 list. Low-voltage lighting systems – IP or otherwise – was a toss-up for the Top 5 list. 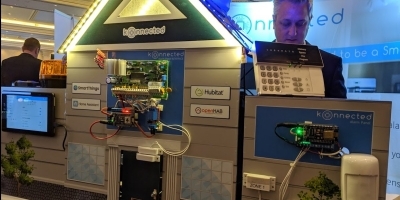 We’ve been calling the category “hot” for several years, but good custom-friendly vendors have been slow to market, and home-tech pros have kept their distance. We don’t expect mass-uptake among CE Pros in 2019, but we do anticipate a surge in interest and a readiness to adopt the new lighting paradigm. 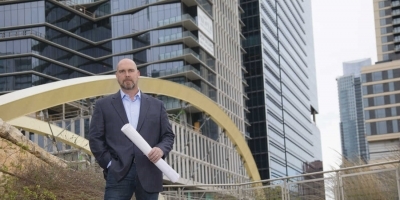 Several vendors have embraced the channel with special products and programs, industry buying groups are pushing the category big-time, and dealers see it as an opportunity to beat the electricians to any given new-construction project. ⇒ The CE Pro community barely mentioned low-voltage lighting as a Top 5 trend, but when we suggested the category, they generally concurred it was a must-have on the 2019 list. For at least two or three years, integrators have struggled with workforce development, unable to staff their businesses to fulfill project pipelines. This year, the situation is more dire than ever, with near full-employment, a huge middle-skilled labor gap, under-promotion of low-voltage installation as a career choice, and even competition from traditional employers like Amazon now offering $15 per hour. 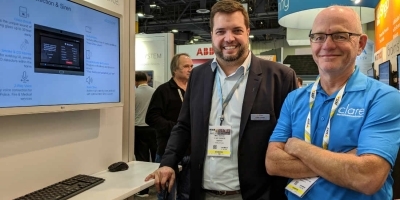 This year, we saw a swell of new companies providing outsourced labor and recruitment services specifically for A/V integrators, plus efforts from industry trade groups like CEDIA and CTA to advocate for low-voltage integration as a career choice. INTEGRATORS: Please share your experiences in any of the Top 5 Categories! In 2019, the labor crisis will finally require that integrators get creative with HR, possibly sharing labor with each other or turning to third-party installation firms like Dish Smart Home Services. ⇒ Oddly enough, while the labor crisis tops every list of dealer challenges and fears for this year and next, no one mentioned the theme when queried about the Top 5. Surely they will agree it belongs on the 2019 list. CE Pro grappled with this one – practically a theme of our own invention – but we concluded that the industry’s focus on design is exploding, garnering new profits, strong trade partnerships, and mindshare of consumers who don’t care about technology … unless it is showcased or obscured by design touches. So many emerging themes of 2018 have architectural, interior and industrial design at their core – light fixtures and lighting design, beautiful displays that can double as wallpaper or artwork, in-wall mounting systems for everything from Echo Dot to wireless access points, architectural mounts for obscuring keypads and outlets in the wall, motorization of everything …. 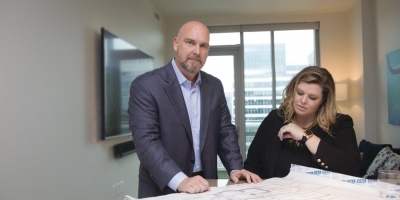 Dealers, manufacturers and trade associations have upped their engagement with design trades, and they seem to be gaining the respect they deserve. ⇒ None of the home-tech pros queried about the Top 5 mentioned “design” as a hot new trend for the channel, but they did cite many themes that would fall under the category – MicroLEDs, light fixtures and shades, motorized mounts, and general engagement with the design community. Cord-cutting has been a “thing” for at least the past five years, but will accelerate in 2019 as more options emerge for content, delivery and subscription models. Traditional cable and satellite providers are now offering skinny bundles, networks themselves are streaming content direct to consumers, live news and sports are becoming more accessible, and top streaming service providers like Hulu and Netflix are cranking out their own binge-worthy shows. On top of this, we’re seeing a steady stream of new cord-cutting hardware that meld streaming services with over-the-air content. The new ATSC 3.0 standard will help cable companies deliver OTT (over-the-top) streaming services, and 5G networks will enable new content-delivery platforms from sources we can’t yet fathom. 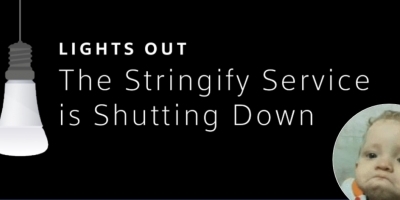 ⇒ When queried, the home-tech community named cord-cutting as a key new trend and opportunity for 2019. 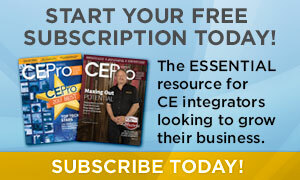 Please share your experiences and insights for our January Top 5 issue of CE Pro. Contact Julie Jacobson for editorial, or your account rep for sponsorship opportunities. Julie, good call on including low voltage lighting, I see that as a big growth area for dealers. If there are a couple things we see a lot of in our software lately it’s cameras and LED lighting. Our new office in Phoenix is fully outfitted in LED lighting, over the air TV and cameras. So far as design we went for your favorite, mid century. Dealers can build a whole business around these technologies, time for a new paradigm. AV seems so small compared to all these new emerging opportunities. A dealer could read down your list over the last few years and create a whole new business model. One from column A, two from column B and so on……..